‘Donald’s Golf Game’ is the third film featuring Donald and the nephews. Donald’s in for a game of golf, and it’s clear he only uses his nephews to be caddies, without granting them anything. Naturally, the nephews take matters in their own hand, with ‘Goofy Golf Clubs’: one changes into a net, another into an umbrella, and a third one into a boomerang. Soon Donald is stuck in a rubber band, while the three brats are playing the field. ‘Donald’s Golf Game’ is a genuine gag cartoon, but once again Jack King’s timing is ridiculously slow, spoiling otherwise fine gags. In the family’s fourth outing, ‘The Hockey Champ‘ (1939), this problem was finally over. Al Taliaferro would set the stage before the film, letting Donald Duck play golf in his daily comic strip from October 24 to November 5. 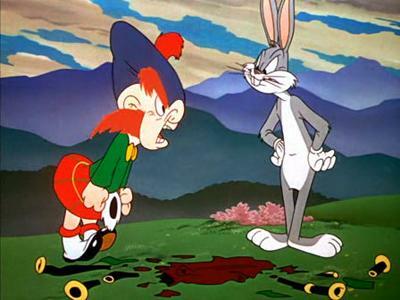 Bugs misses a turn at Albuquerque and ends up in Scotland. When he mistakes a Scotchman’s bagpipes for a monster attacking an old lady, he ends up playing golf against the angered Scotchman. Of course, Bugs wins the game, which consists of several blackout gags, and he even manages to defeat the kilted guy at playing the pipes. The Scotchman looks like a cross between Elmer Fudd and Yosemite Sam, but who hasn’t got anything near the personality of either of the two. Therefore the interplay between our hero and the villain never really come to live, despite some nice facial expressions on Bugs’ adversary. Peter Alvarado’s backgrounds do not help: they are too vivid to ignore, but have none of the beauty of either Jones early 1940s cartoons or his cartoons from the 1950s. Instead they express a strange mix of realistic and more stylized patterns. The result is a rather mediocre entry in the Bugs Bunny catalog.